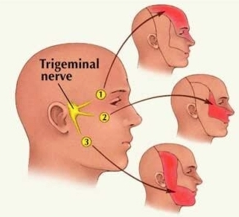 In typical trigeminal neuralgia pain is severe, sudden, like a shock in one side of the face which lasts for seconds to few minutes. These pain attack may occur over a few hours also. Atypical Trigeminal neuralgia pain is constant burning which is less severe as compare to pain felt in typical type. Pain may get triggered by touch to the face. As per Dr.Abhishek, due to involvement of nerves, the condition is very painful, incidence of the condition is seen more in person with age 50yrs and above, though clinically at aura homeopathy we have seen that this condition can occur at any age, and females are more prone to get trigeminal neuralgia. Sever pain which can be violent, jerking, stabbing, piercing, zapping, sharp, shooting in nature and is unbearable. Reoccurance of pain attacks can lasting for a few seconds, minutes, days, weeks or even months if affection is severe. Sensitivity of the affected part. The patient is often seen crying loud because of intense pain. At times severe pain lasting for days or months. and no dental pathology is related then there are chances you are affected by trigeminal neuralgia. MRI & Reflex tests are done to confirm the disease. In allopathy treatment pain gets better temporarily with the use of allopathy medicine, till the action of allopathy medicine, there after it again regain its intensity. There are 132 homeopathy medicines which give best relief in trigeminal neuralgia. However, the correct homeopathy medicine choice and good relief is only possible with the experience and right judgment on the part of homeopathy doctor. The Homeopathy treatment is based on case taking.